This entry was posted on October 12, 2018, 13:12 and is filed under Arts and Crafts, Patchwork and Quilting Projects - General. You can follow any responses to this entry through RSS 2.0. You can leave a response, or trackback from your own site. I incorporated coffee rings into the quilting design for that very reason 😉 Also, now I know Vanish powder does wonders getting stains out I’m not so worried about anybody being too careless with the drips. 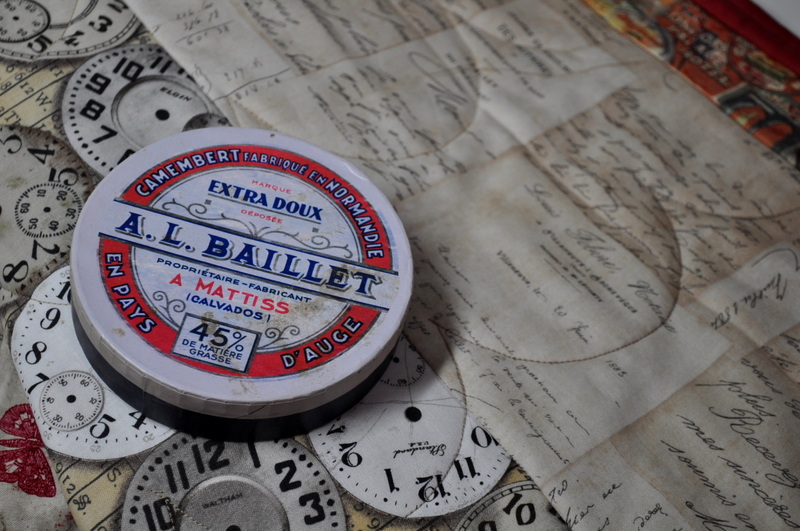 Oh my this is lovely and Tim Holtz does fabric as well as paper crafts. Love it. Yes, I think I first heard of him when I did a bit more rubber stamping and his designs are very different when you fancy something a little quirky. It’s lovely, it’s so gentle and calm, perfect for your coffee table. It is possibly the only gentle and calm thing in my living room come evening when it’s full of dogs, cats, knitting/crochet projects and the occasional human trying to watch Strictly. 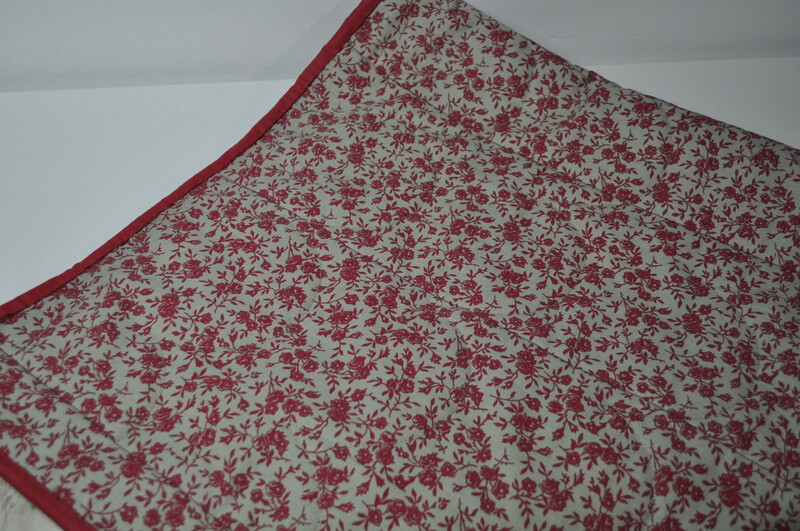 I think it’s a pretty table runner. I confess to not understanding most of the quilting terminology but the outcome seems to fit with the decor of your setting. Home furnishings is one of those mysterious arts that I fear are beyond my grasp. That ombre stack had me drooling btw. I try not to be too technical in the quilting blog posts as I know not all of my readers quilt. Not all of my readers are dressmakers either but I sometimes wiffle on about that too and hope nobody gets too bored. If in doubt I stick a photo of a cat in. I refuse to believe you would find home furnishings beyond your grasp if you put your mind to it. As it is, with making clothes not only for yourself but for your husband and little ones, I think the house will have to wait. Point well made. Personally I don’t find it boring to read technical bits of other crafts, I squirrel them away and build a loose understanding. You are right though, one day I will decide to focus on home furnishings and that will be that! I’ll bet some of his fabrics would make a very cool duster 😉 Imagine swanning around covered in vintage luggage labels. Oh that turned out great for your room! I think I need to go reconsider my favorite fabrics that go with nothing…this might be the fix! I need another one for my dining table – I’m almost out of those fabrics now but I’m sure I could dig up something else on the quirkier side in my stash. What a fabulous project Lynne! It looks perfectly at home in your lounge room. 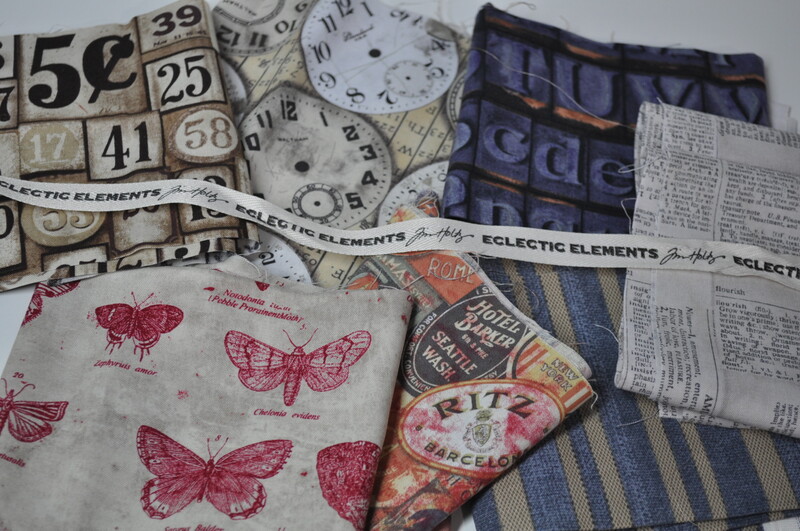 I didn’t know Tim Holtz did fabric – is there nothing the guy doesn’t do? I keep my eye on his stamping and mixed media output as that’s my thing and he sure keeps it coming! I have an ottoman under the living room window that is full to the brim with yarn – I really do have to go cold turkey on on-line shopping 🙂 Your stack of ombre fabric is pretty impressive – any plans for that? 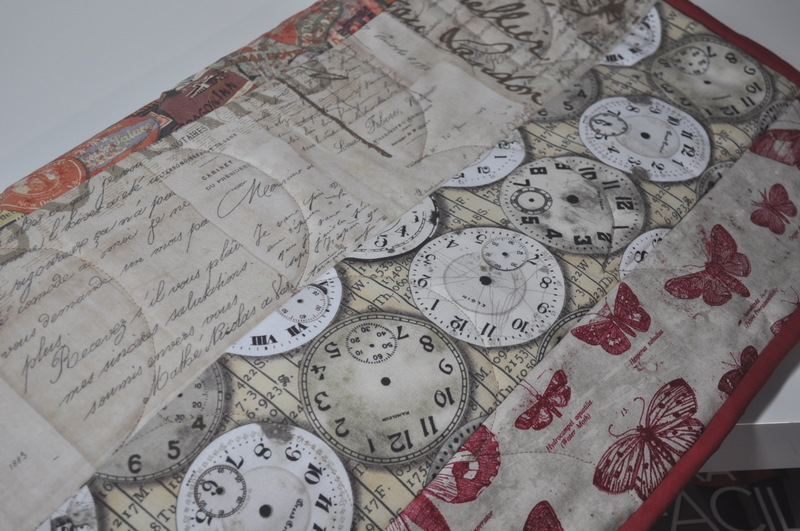 I first heard of Tim Holtz when I used to make cards and bought some of his stamps – I like his designs (mostly) and sometimes a bright, fresh fabric with clean, clear colours just isn’t what you need. My beautiful ombre fabrics are stroked from time to time and, sometimes, used in quilting as you will see in my next ScrapHappy post on Monday. Loved Tim Holz’s paper craft stuff, should’ve known he’d do great fabric too. Your runner turned out great, and I love your un-plumped red sofa, probably doesn’t show all the dog and cat hair like my dark blue one does! Most things in my house – unless it’s going on the top floor which is a pet free zone – are chosen deliberately for their ability to act as camouflage for pet hair. It’s a wise move, to choose fabrics that camouflage…..but I particularly liked my sofa for looks and price, but the only other choices were lime green and an orangey shade. I put throws over mine to keep it relatively pet hair free. I was surprised to read that you hadn’t tried that “quilt as you go” method before! That’s the way I did my very first quilt projects when making place mats with bands of fabric – only thing I had trouble with was ironing fabric out the right way without iron touching the wadding lol. Your extra quilting with semi-circles gives it a lovely texture and the new table runner looks great in your living room. My very first project was a King Size sampler quilt which I started making when I joined a little Patchwork group local to where I used to live in the U.K. – it was so big and scary (the quilt not the group) that I did actually have that one long arm quilted although I was a little disappointed with the outcome as I don’t think the woman had been doing it long at that point. If I’d known about the QAYG method then I might have tackled it but, being blocks, it would have had to have been the method I’ve used a couple of times now for the F2F blocks rather than the strip method. I don’t make many home furnishings projects really but I do need another table runner so will probably use the bands method again. 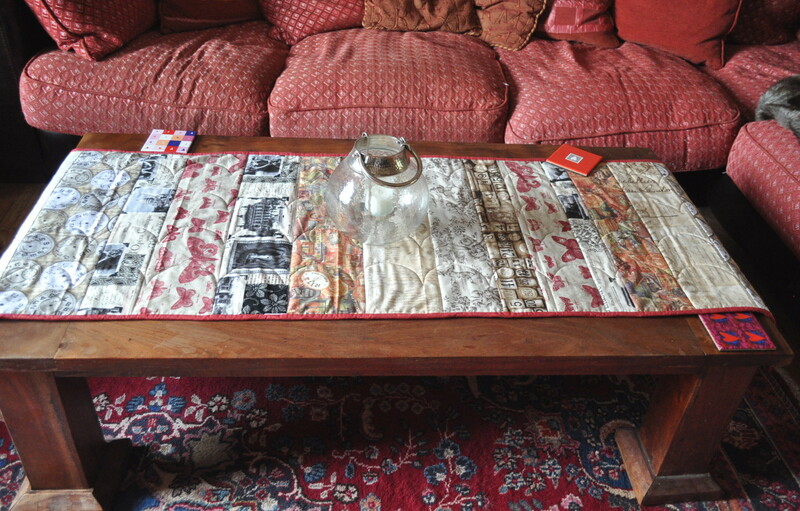 Isn’t it wonderful to have the vision and the skill to be able to see a need (coffee table runner) and just be able to whip up the perfect one!? Such a great project! It helps to have very large fabric stash too! I guess it’s the sort of thing you’d be able to do too but how long would it take from start to finish to weave a 170cm long table runner for example? If I focused and just worked on weaving a runner, it would take 2-3 days, I think. Don’t know–I never get that focused! Oh, that long? I imagine quite a bit of time is taken up with the setting up of the loom etc. What fun that runner is. Yes, Massdrop was still going last I checked this summer. Your solids are a lovely stack! I daren’t go and look. Lovely when you can produce functional things. Not just fluffy things to look at. Although sometimes fluffy is good. So pretty! And perfect in the room. How do you manage to keep the beasts from pulling it right off the coffee table? Do you think the method used on your runner would be good for a beginner? 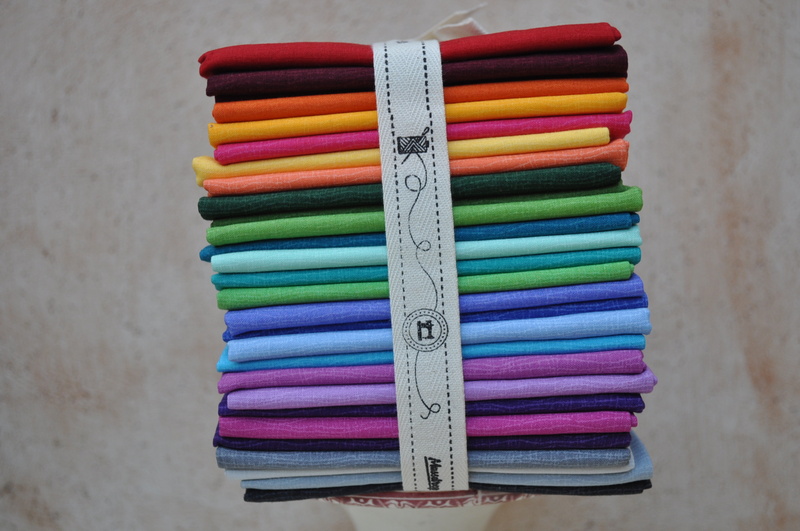 I will be making a baby quilt (did you just fall off your chair?!?) in a space theme and am pondering the simplest way. This might work, or perhaps just whole cloth with lines across. The beasts aren’t allowed in that room unaccompanied so, so far so good. I think you could easily manage this method. As long as you can sew straight lines, you can do it. 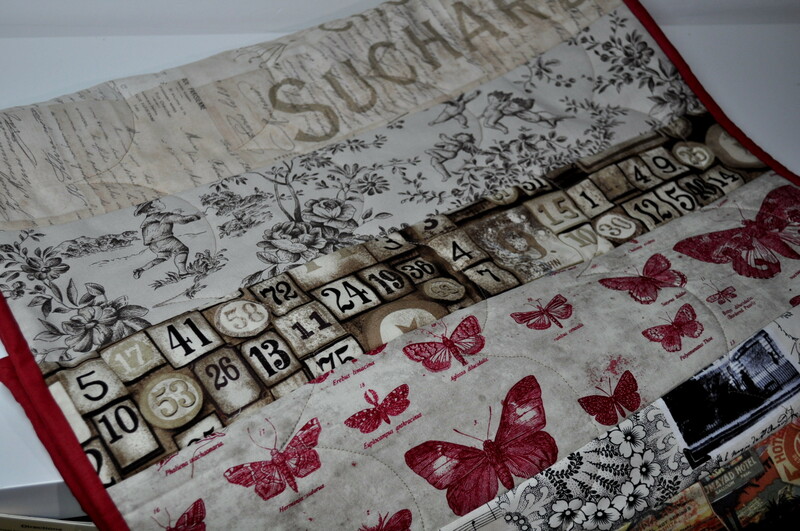 You don’t need to do any further quilting if you don’t want to as attaching the strips to the batting and backing is effectively quilting ‘in the ditch’. Thanks for this – you’ve just reminded me that I really wanted to make myself a Christmas runner like the one I made for a Stitching Santa recipient previously. Trouble is, I’ve none of that fabric left…..now what were they called, Massdrop? You’ve described a technique I’ve used frequently and quite enjoy. 🙂 I love the way your runner turned out. 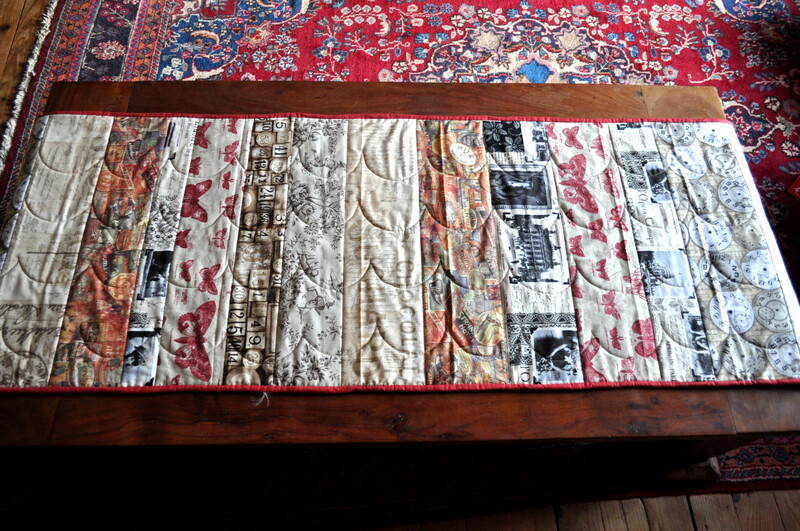 I have some of those same prints – just have to come up with the table for which to make a runner! It’s a method perfectly suited to a table runner isn’t it and I’ve also seen some lovely crib quilts made in this way.